It’s pretty remarkable, really. The v0.4 board will be much more comfortable on the back of the hand. I’ve kept much of the same layout, but moved a couple of the modules over to the right side of the Teensy++ board, so that the whole thing can be about 0.1″ narrower and over half an inch shorter. There’s a kind of “double wing” visual effect now, since the various modules now hang off both sides of the board. Although this would never do for a commercial retail product, it is very valuable for the kit version, since it allows the very rigid PCB that actually sits on your hand to be as small as possible. And this time, I really this it is just about as small as possible. There is almost nothing left to rearrange, and doing so at all would require modifying the WT12 module’s GPIO pins, which I’m not planning to do since it would make that board much less simple to prototype with on its own. I’m also now officially switching to SparkFun’s new MPU-6050 breakout board instead of using their 6DOF IMU combo breakout board. 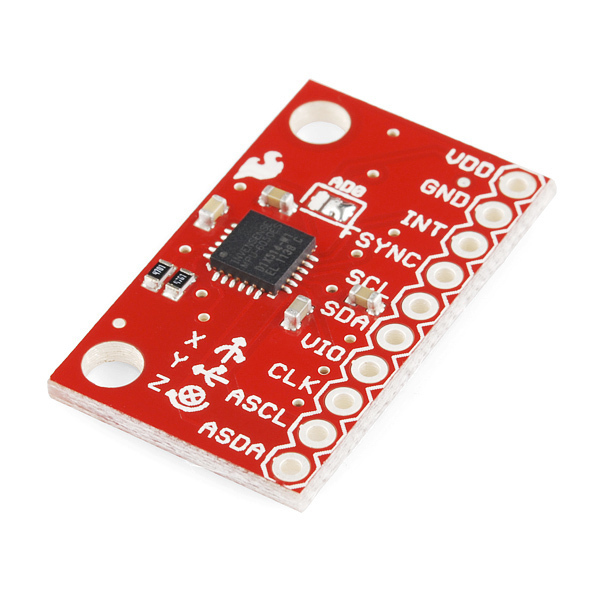 Both modules have an accelerometer and gyroscope, but the MPU-6050 does it in a single module, faster, more accurately, with no potential axis alignment issues, with a powerful DMP, for $25 less. What’s not to like? The v0.4 board still has a dedicated header for the 6DOF IMU board, and the embedded software will continue to have support for both, but it is probably best to get the MPU-6050 board instead if you’re looking to build your own prototype and you don’t already have a 6DOF module. It’s just a better option all around, and saving a whole $25 just like that on the overall cost of the kit is pretty significant, especially with the added benefits of future DMP usage (which is close, but still not functionally useful for the Keyglove just yet). OSH Park won’t allow holes within 15 mils of the board edge, but maybe they could be cnecinvod to look the other way. I tried what you did above too and had a flap of copper left on each hole, which I suppose is slightly better, but still not good enough.